I was a single autistic parent with 1 neurotypical and 1 ASD child to my care. I "get" how tough parenting can be. I remember many a night lying in bed weeping for the alone/helpless feeling that I had. I had no idea sometimes how I was going to physically survive. My life was completely different after children. My "normal" was completely redefined. I could not keep relationships. I had no money. 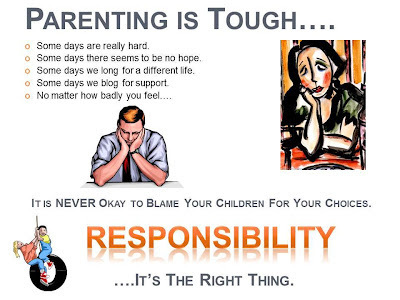 And yet through all of these tough times I never once had the urge to blame my children or anything about them for my broken relationships, my career failures or even my hard financial life. I had made the choices that got me and them into the tough spots that we were in and I had to make different choices to get us out. And that is what I did, all the while not just paying lip service to loving my children and accepting them for who they were but demonstrating to them through my actions. I protected and guarded their unique beings and supported them throughout their lives and as they grew into mature, young women our language and roles changed. Back in the early '90s I had a class at my job about leadership. I remember the teacher drawing a line and saying that the line was between "taking responsibility" and "being a victim." He stressed that we all have the choice of these two things for everything in life and that leaders take responsibility. I took that class to heart and have tried to live my life with his lesson in mind. Today my girls and I are best friends. In fact we have always been best friends. When you read blogs about parenting children, ask yourself if the author is taking responsibility or being a victim. If the latter, ask yourself if you really want to support/enable this behavior and this blog. Ask if reading this sort of language is helping you and your situation or hurting. Ask if you need to find other role models to help you move from being a victim to taking responsibility.